At age 42, David Steele unloaded for the Southern Sprintcar Shootout Series event at Desoto Speedway. Tonight he could have claimed his 100th win, in the state of Florida. Desoto Speedway is a 3/8 mile asphalt track in Bradenton, Florida. Billed as ‘The South’s Fastest 3/8th Mile Short Track’ it’s a high banked bullring. About an hour later things had taken a turn for the worst. The track offered a brief statement on the passing of the USAC National Champion. 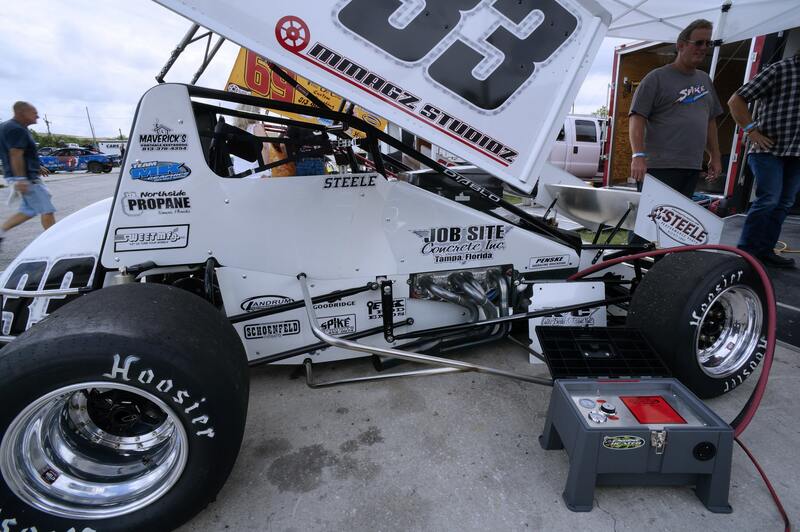 Tonight, David Steele was driving the #33 sprint car. From behind the wheel of his winged sprint car he found himself in a race for position on track. It was his last battle. His racing career began in 1981, in Karting at age 7. He became a permanent short track driver. Steele made a name for himself driving all the ‘badass’ stuff. Twitchy, sensitive cars with lots of horsepower and quick lap times. He even had a brief career in NASCAR. He netted a best finish of 23rd NASCAR Busch Series. The famed open-wheel driver also gave INDYCAR a try. However, he was a short track legend and that’s where he returned. Steele trails only Jack Hewitt and Brian Tyler on the USAC Silver Crown career wins list. He has more USAC Silver Crown pavement laps led and more wins on pavement, than anyone. His first Silver Crown win came in 1996 at Memphis Motorsports Park. He was also a 5 time winner of the Little 500. A prestigious event hosted at Anderson Speedway. The track is a quarter mile high-banked paved short track in Anderson, Indiana. David Steele wasn’t done. In 2016, David Steele won the opening 5 races of the Southern Sprintcar Shootout Series. All 5, in a row. He also won the last Southern Sprintcar Shootout Series event on February 25, 2017. That win was claimed at 417 Southern Speedway in Punta Gorda, Florida. Dave Steele was also the owner of Steele Performance Parts. The company is based in Florida, offering racing parts for all forms of motorsports. In lieu of flowers, to make a donation, people may direct their contributions to the USAC Benevolent Foundation website at www.usacbf.org/give. Checks should be made out to the USAC Benevolent Foundation in the name of David Steele and mailed to 124 E Northfield Drive, Suite F #129, Brownsburg, IN 46112.